celebrates on Sunday in Rochester, N.Y.
Rochester, N.Y. became stomping ground of the Land of 10,000 Lakes this past weekend as two Minnesota corps, Minnesota Brass and the Govenaires, became Open and A Class Champions at the all-age Drum Corps Associates World Championships. Taking first place by just three tenths of a point at the Prelims, Minnesota Brass made history at Rochester Rhinos stadium on Saturday, Sept. 3, snapping an unprecedented six-year winning streak of the Reading Buccaneers. The corps from St. Paul, Minnesota widened that lead the next day at the Finals competition on Sunday, Sept. 4, ultimately tackling the East Coast juggernaut, 98.35 to 97.45. "This achievement is the result of years of program development, evolution and strong support from staff, volunteers, alumni and friends. The entire Minnesota Brass family maintains a commitment to excellence and is proud of this achievement," the corps posted on its website following the win. 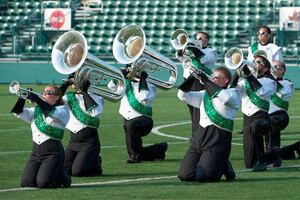 2011 not only marks the first World Championship in the history of Minnesota Brass, but also the first time a Midwestern corps has taken home Drum Corps Associates' top honor since its founding in 1965. Some have recognized Minnesota Brass' win as a turning point in DCA history, as over more than 45 years, competition has been dominated by corps from New York, New Jersey, Pennsylvania and Connecticut. "Congratulations to Minnesota Brass ... DCA is competitive again," Twitter user Drumlaw80 said. 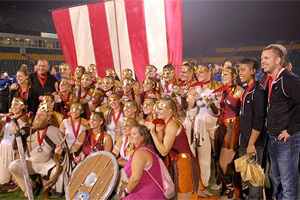 The Reading Buccaneers remain one of the most successful corps in DCA history, with 10 titles to their credit including the very first DCA Championship in 1965. The end of the corps' undefeated streak that spanned from 2005 into 2011, accounts for a record 64 straight wins. "Despite these accomplishments, the organization's greatest achievement is the positive impact it's made on the lives of hundreds of men and women of all ages who have worn the Buccaneers uniform," the corps posted Monday on its Facebook page. And even at the end of an era, the Buccaneers are taking their first loss in years in stride and looking forward to turning a new page in the corps' history book. "It's a pleasure to share the field with you [Minnesota Brass] and it's great to see good fortune follow such a classy group of people," said Tom Moore of the Reading Buccaneers. "It's clear that our mutual respect and admiration run deep. We look forward to seeing you on the field in 2012, and wish you all the best this off-season. Congratulations!" Also in the Open Class, Rochester's own Empire Statesmen finished in third place with a score of 95.55. This is the corps' fifth straight third-place finish at the DCA World Championships. In Class A competition, the Govenaires of St. Peter, Minn. took home the gold medal with a score of 84.93. In second was last year's champion Fusion Core (83.93) of Morris County, N.J. Carolina Gold (83.85) of Greensboro, N.C. took third. 2011 marks the third Class A title in Govenaires history. The corps last won two years ago in 2009 and for the first time in 2006. DCA's Mini Corps competition kicked off festivities on Friday, Sept. 2 in Rochester. Star United, a small ensemble with ties to the former DCI member corps Star of Indiana, bested a field of six other groups with a perfect score of 100 points. 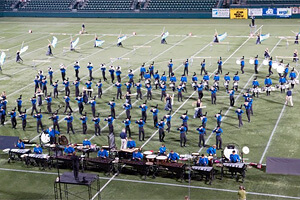 Visit DCACorps.org for a recap of all DCA World Championships scores. Photos courtesy of the Facebook pages of Minnesota Brass, Reading Buccaneers and Govenaires.